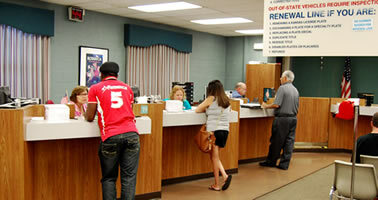 Kansas’ 105 county treasurers handled vehicle, registration, tags and renewals. The treasurers also process vehicle titles and can register vehicles including personalized license plates. Application for a certificate of title and registration must be made through the local county treasurer’s office where the vehicle is garaged. To avoid penalties vehicle registration must be made within 60 days of the vehicle’s purchase, the day the title was assigned to the new owner or the day the bill of sale was completed for an antique vehicle. Kansas Division of Vehicles can print duplicate titles, and customers can reprint tag renewal notices online. You will need to take the vehicle and the title* for the vehicle to a Kansas motor vehicle inspection station and obtain a Motor Vehicle Examination (form MVE-1) before going to the county treasurer’s motor vehicle office. Contact the county treasurer’s office or check the Kansas Highway Patrol's website concerning the location and hours of operation of the inspection station. Take the title*, the pink copy of the MVE-1 and proof of insurance with you to the county treasurer’s motor vehicle office to make application for a Kansas title and registration. *If the title is being held by your lien holder or if the vehicle is being leased, the lien holder or leasing company will need to fax the front and back of the title to the county treasurer's office or the motor vehicle inspection station. The faxed copies will be used to complete the motor vehicle examination resulting in the issuance of an MVE-1. Take proof of insurance, the pink copy of the MVE-1, the copies of the front and back of the title, and a current valid registration receipt from the state in which the vehicle was last registered to the county treasurer's motor vehicle office and make application for title and registration. If the paperwork is complete, (the treasurers office will not accept an expired registration) a license plate will be issued at that time. The Titles and Registrations Bureau will send a letter to the lien holder or leasing company requesting they surrender the title they are holding to the State of Kansas. A new Kansas title will be issued and mailed back to leasing company, if there is no lien holder. If there is a lien on the vehicle, the Kansas Division of Vehicles will hold the title electronically until the lien is released. If the lien holder or leasing company will not surrender the title, the applicant and the lien holder or leasing company will need to work out a way for the title to be surrendered, or the registration will not be renewed. The vehicle cannot be operated without valid/current registration. If the title is being held electronically by another state, the current valid registration receipt from the state in which the vehicle was last registered will be used as proof of ownership for accepting the application for title and registration. The Titles and Registrations Bureau will correspond with the lien holder and/or the other state to request the title be surrendered to the Kansas Division of Vehicles. If the title is not surrendered, the applicant and the lien holder or leasing company will need to work out a way for the title to be surrendered, or the registration will not be renewed. The vehicle cannot be operated without valid/current registration.